It’s no secret that I adore Courtney Milan’s books, and Free has probably been my favorite side character throughout the Brothers Sinister series. I was so excited when I found out that she was going to be the next and last book in the series. Milan writes awesome heroines because they are intelligent and capable, and Free is one of the most capable of the bunch. Edward was the perfect match for Free, even though he did not believe it. Edward believes that he is a scoundrel, but he is back in England to help his best friend’s little brother out of a jam. At the center of that jam is Free. It was wonderful watching Edward try to scoundrel his way into helping Free. Free would not be bullied or blackmailed, and Edward was charmed by Free’s cleverness and idealism. My favorite kind of romantic hero is the one that believes he is a bad man, but who does bad things for good reasons, and finds redemption in the heroine. Edward finds something to believe in when he finds Free. One of the best parts of The Suffragette Scandal is the banter between Free and Edward and seeing Free get the best of Edward. Instead of getting mad, Edward is just all the more attracted to Free. It was a little odd at the beginning that a lot of the story is seemingly told from Edward’s point of view. Even though it is written in third person, the point of view begins with Edward. We also see a lot of the scenes from Edward’s perspective rather than Free’s. I thought we would get more insight into Free’s mind, and we do, but with Edward’s opinions. I began to see that this was necessary because Edward was so busy lying to everyone, including himself, that it would have been easy for the reader to think that Edward really was a scoundrel. I liked seeing some of Amanda’s story, but I’m kind of mixed on whether I think that it actually should have been included. On one hand, it’s great that more authors are willing to add GLBT characters that are real instead of being the flamboyant caricatures that have been so present in mainstream TV and movies. On the other hand, Amanda’s side-story felt like it was added just to present that issue instead of being a genuine part of the story. I wish that Amanda would have gotten her own novel, or novella at least, like Stephen is getting in Talk Sweetly To Me. The rest of the Brothers Sinister make appearances, even Oliver’s and Free’s parents. I do wish that we would have seen more from the women than men. We only get one scene with Minnie and even less with Violet. It just seemed a little odd that while Free’s newspaper was for women and about women, that this book was mostly centered around Edward’s point of view and contained more of the men than the women in the series. 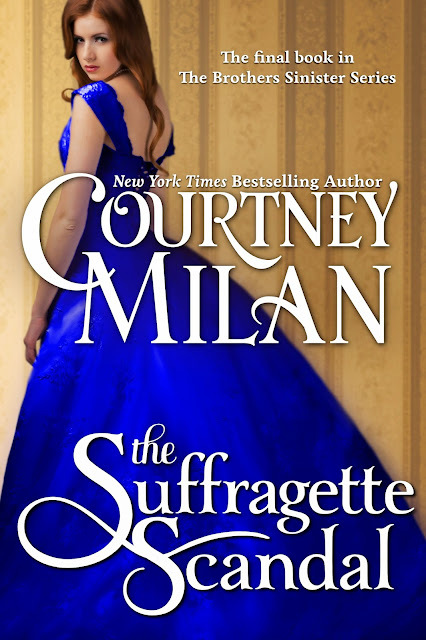 I loved The Suffragette Scandal, but I’m sad to see the series come to end (even though there is an epilogue type novella coming out later this year), especially since this is my favorite series of Milan’s. To cheer me up that this series is ending, Milan is releasing a new series beginning later this year! I recommend this to historical romance lovers who like witty and clever heroines.